When I look around at my house, I can pretty easily spot the “domino design decision” in every room. I’m not talking about the magazine (I only wish my house looked more #sodomino), I mean the decision that caused alllllll the other choices in the room. 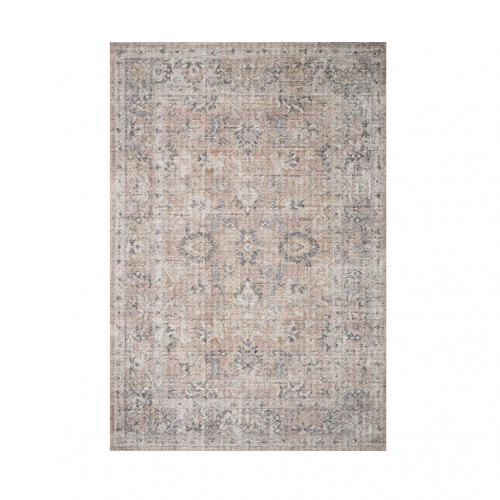 You know, like the pretty new rug that started as an innocent little purchase but makes you want to buy a new sofa, that makes you want new pillows, that makes you change your art. And side tables. And lamps. And! And! And! Well, I gave myself an early Christmas present this year and used some store credit to buy the canopy bed that I’ve had my eye on for a long time. Buying the bed was pushing that first design domino in what turned out to be a bedroom refresh, though I really did try to keep the other room changes to a minimum! :) One important change that I’m thrilled with is our new mattress. The new bed frame is bigger than our old bed so we knew we were going to have to get a new mattress. We have had a Leesa for the past year or two and we’ve really loved it. We have another one in Grace’s room and one for our guest room and they’ve all been great! 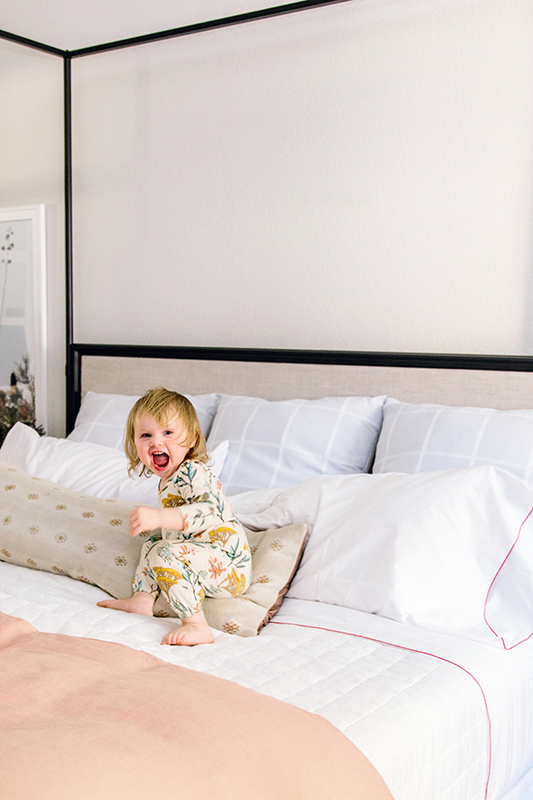 Leesa recently reached out to tell me about their new luxury mattress line called Sapira. 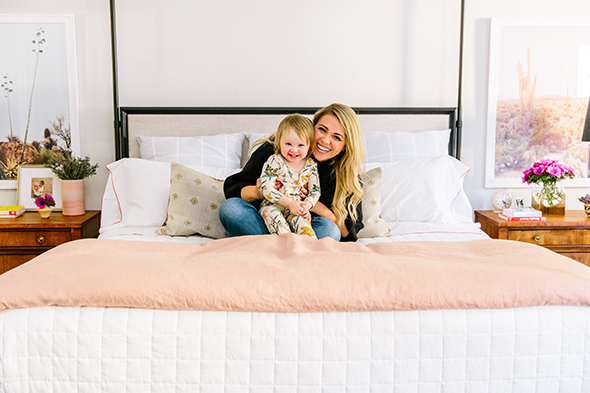 The 100% American-made mattress features a unique pocketspring system positioned between multiple layers of their amazing performance foams so that it offers incredible support but still has that cushioning bounce Leesa is known for! Sounds amazing, right? I was dying to have one for our new canopy bed. 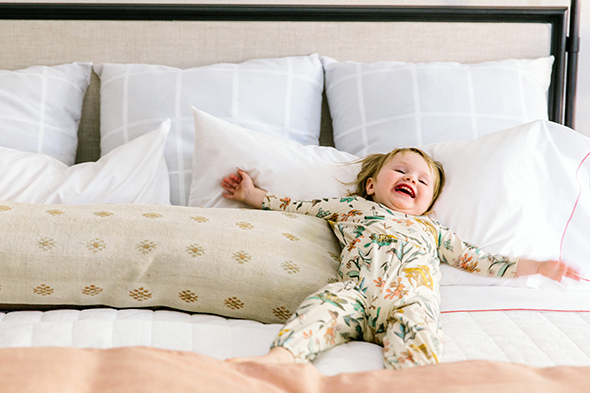 The Sapira mattress purchasing experience is a breeze and completely hassle-free. 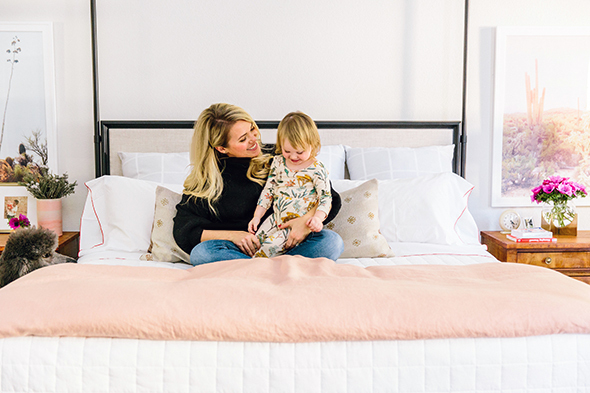 You just buy the size you need online and this luxury hybrid mattress ships to your door perfectly compressed in a box just like the Leesa mattresses. You have 100 nights, risk free, to sleep on the mattress and be sure it’s right for you. If for some reason it’s not the best fit, they will give you a full refund and coordinate a quick and easy pick-up. 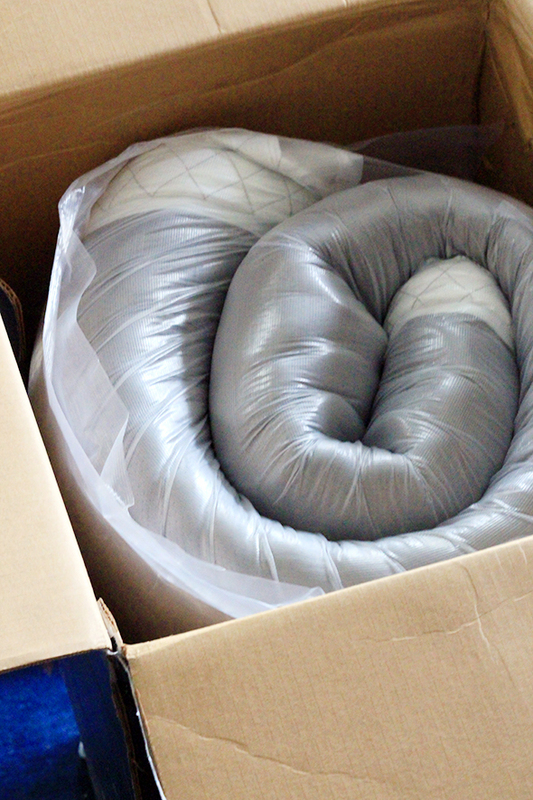 The mattress arrives in a vacuum-sealed bag and is tightly rolled up in its box. You just have to place the sealed mattress on your bed foundation, and after you cut away the bag, the mattress springs to full size in just a few seconds! I didn’t even have time to take a photo before our new mattress sprang to life! :) It’s that quick! Just like with the Leesa (an maybe even more so?) 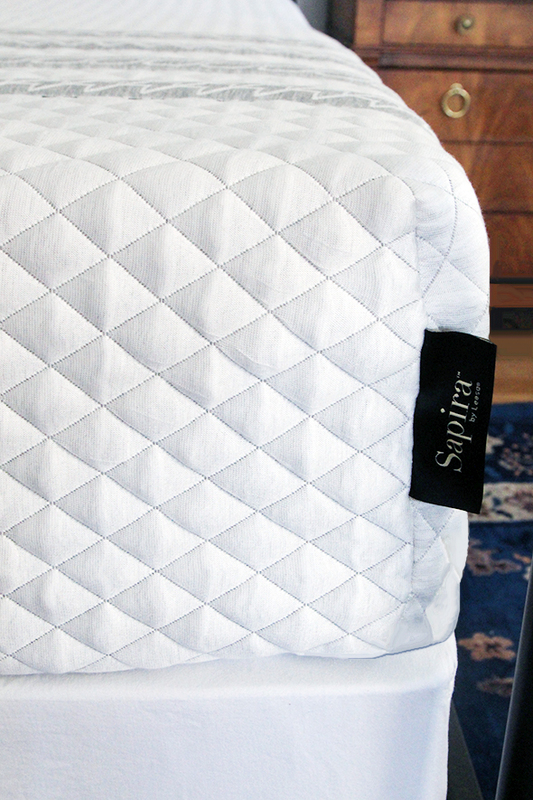 the knit Sapira mattress cover feels like the softest cashmere sweater. It’s almost a shame to put bedding on the top of that beautiful cloud! 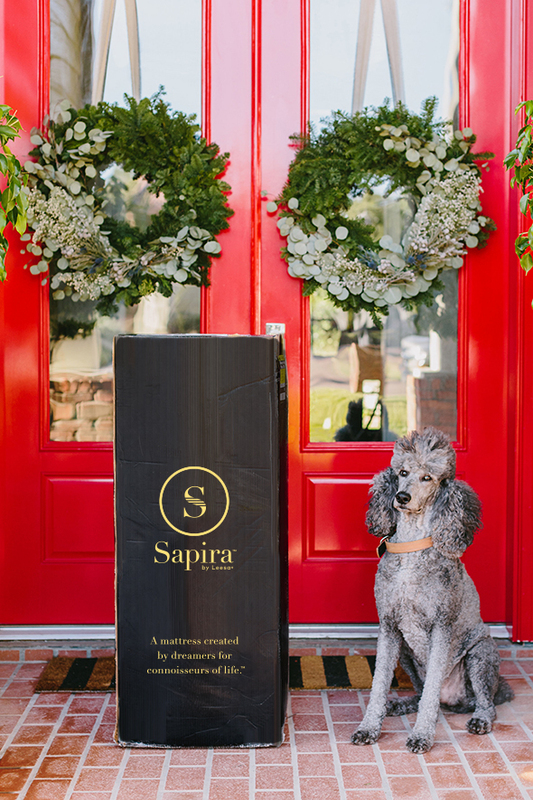 If you’d like to get your loved one the gift of a GREAT night’s sleep for Christmas this year, Sapira is offering $100 off for LGN readers with the code LGN100! 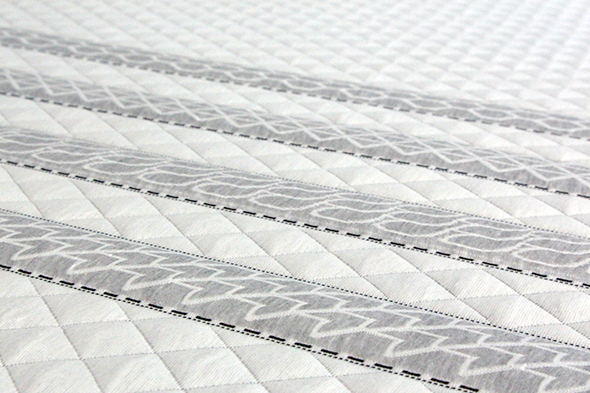 I know you’ll love this mattress as much as we do. This post was a collaboration with Sapira by Leesa. Thank you for your support! As always, all opinions are my own. 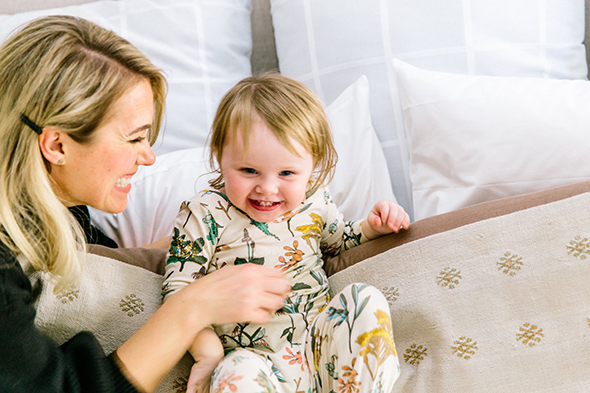 Click HERE and use my code LGN100 for $100 off your Sapira mattress. Thank you Tiffany Haynes for these precious photos of our sweet Margot! Beautiful!! Will you share other sources? Bedside tables?? Linens?? Hi Megan! :) The bedside tables are antique – I got them years ago in Philadelphia. The bedding is from West Elm, Crate and Barrel and Etsy sellers. Hope that helps! I love the tan/patterned lumbar pillow! Where is this from?? It’s from Etsy! I linked to the seller in my Gift Guide post. 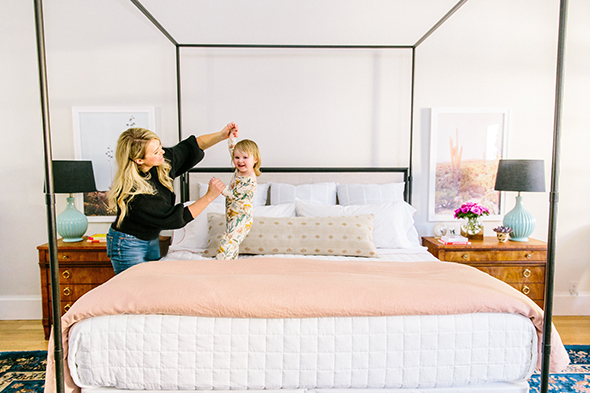 Hi, I would love to know the manufacturer of the bed in this post. I am looking for something similar. Thanks! Hi Abby! The bed is from Restoration Hardware! Thank you! I thought that bed might have been from RH! Everything is just beautiful! The color is Behr’s Silver Drop! Can we talk about Margot’s jammies??!! Would you mind sharing the source please? And HOORAY for new blog post! Thank you! Your room looks amazing, but I’m dying over the wreaths on your front door. And your perfect poodle! What a nice room refresh! To add to the source questions, I am wondering about the vase that is to the right of the bed (in the pictures), the clear round glass vase sitting on a stand. It is lovely. Super interested in this too! So glad you are blogging again, i missed ya! Can you share specific links to the bedding and things on the bedside table? Hi Samantha! Here are the links you’re after! The bedside chests are antique and the Euro shams are from Homegoods. LOVE those prints above the bedside tables. Did you take them? Or where are they from? Sweet, fresh bedroom! I love it! 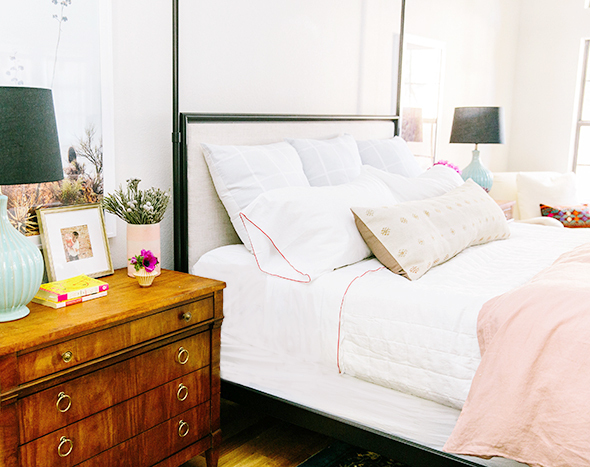 Would you mind sharing where the white quilt on your bed hails from? I’m seeking one out for my own bedroom refresh! Thank you! What a smile Margot has! She looks so happy! I love this room. 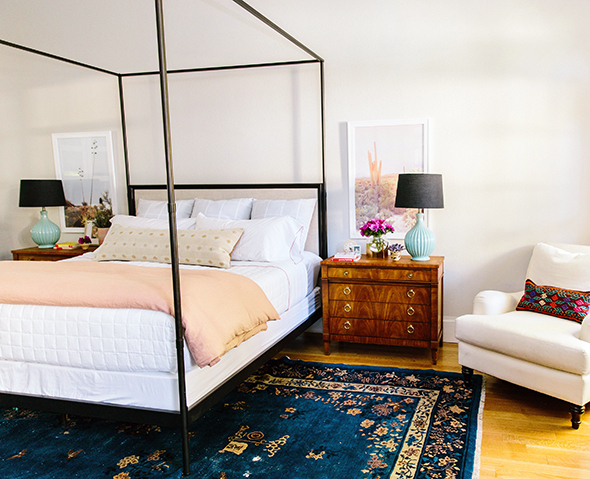 Would LOVE to know the source for the rug, lamps, and bedside tables/dressers. All gorgeous choices. Thanks! Hi Sandy! All of the items you asked about were vintage finds! The rug is from eBay and I did a post a few years back about what search terms I use. Hope that helps! What color of red is that on your front door? It is the perfect shade I’ve been looking for! 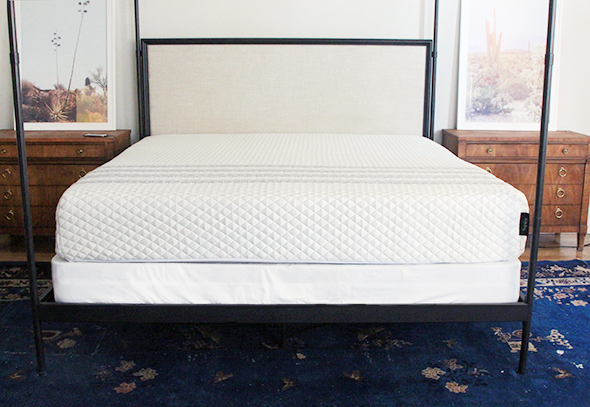 We are on the hunt for the perfect mattress and decided to move forward with the Leesa. 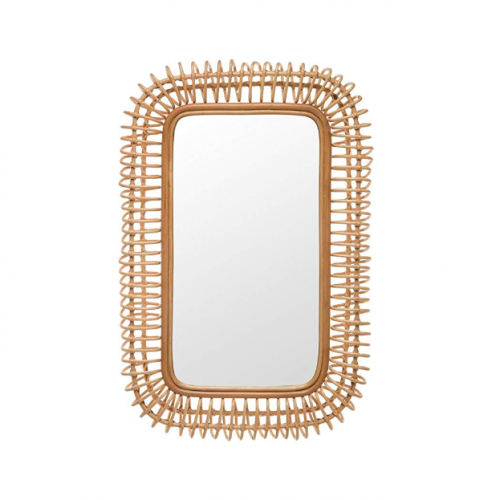 However, just prior to ordering I discovered the Sapira option. Since you have slept on both what would you have to say about them in comparison? Now we do not know which one to choose! Beautiful. Just purchased a bed last year. Wish I had seen this post first. Thank you for the thorough review! And for answering my question on Instagram about your old mattress — I should have read the blog post first and I would have known! Sorry! I want one of these mattresses — they look heavenly! Jenny, so pretty and fresh, as always! 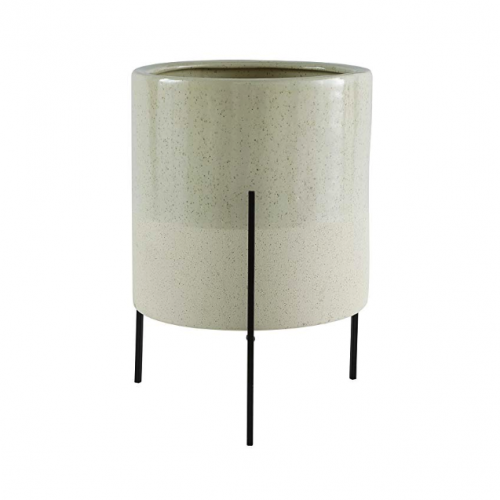 I love the coral/blush base on the lefthandaude bedside table! Where did you find it? Thanks! Jenny, so pretty and fresh, as always! 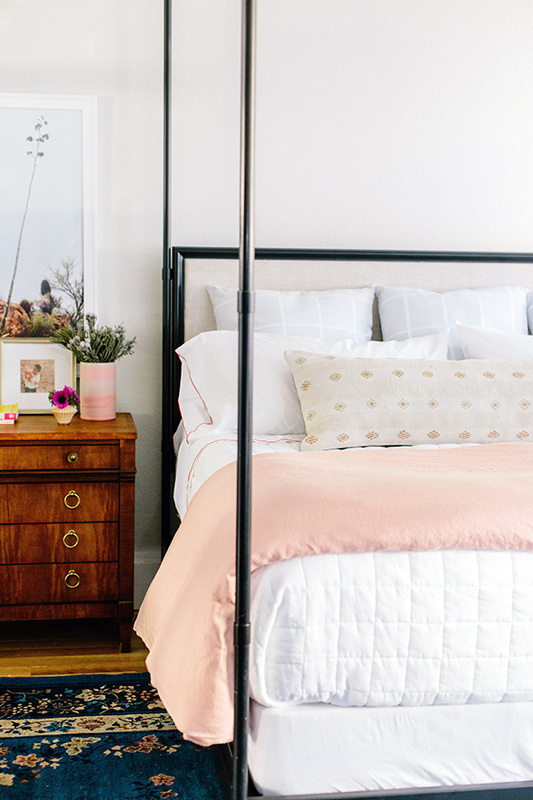 I love the coral/blush base on the lefthand bedside table! Where did you find it? Thanks! Hi Lousia! 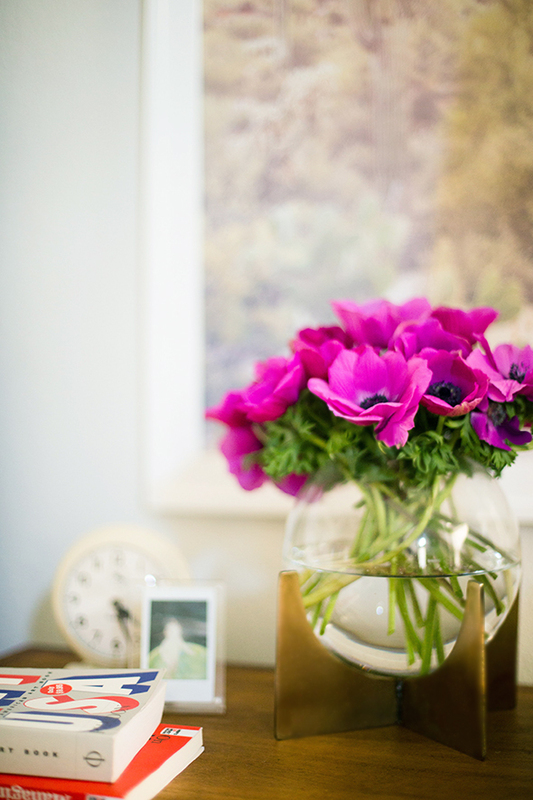 That vase is from Tortus Copenhagen and was a birthday gift from my husband. It’s one of my treasures! Love it so much. Just looked at west elm and only color similar to your “blush” duvet is called rosette. Is that the same? Just want to be sure because yours looks like beautiful petal /shell pink and don’t want to order and be shocked. How do you like living in this bright airy bedroom compared with your former gorgeous but dark and moody bedroom? 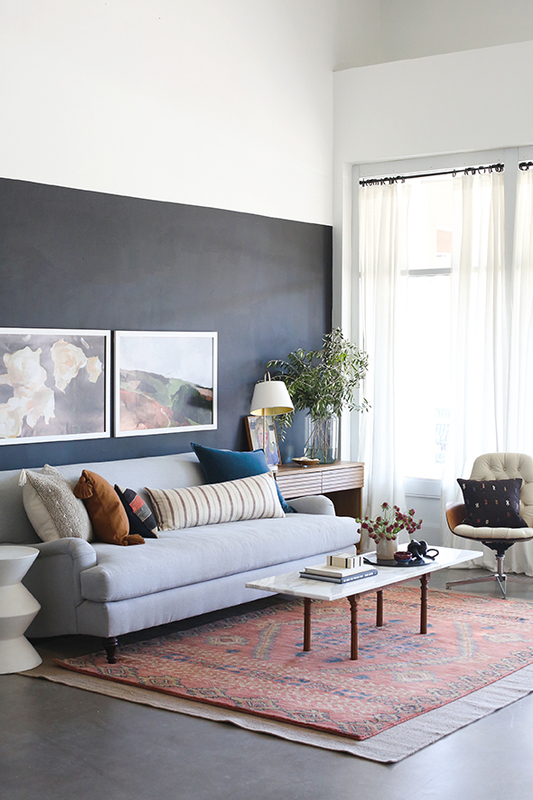 I have loved both the light and the dark paint colors. The dark was cozy and cave-like in the best way, but the light is so pretty. I think that’s my favorite part about painting – that it’s super easy to change every few years! Thanks so much, Jenny! You’re the best! 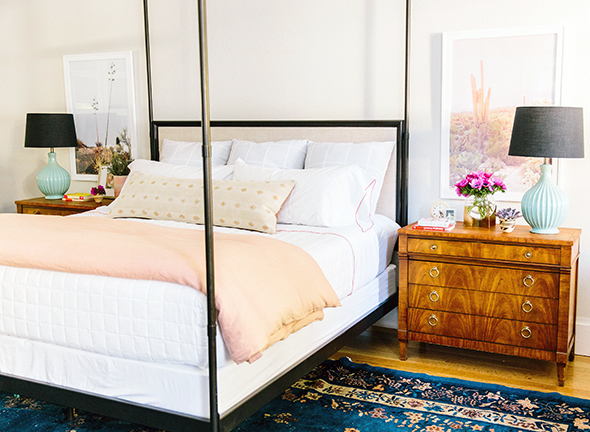 So envious of your beautiful bedroom! 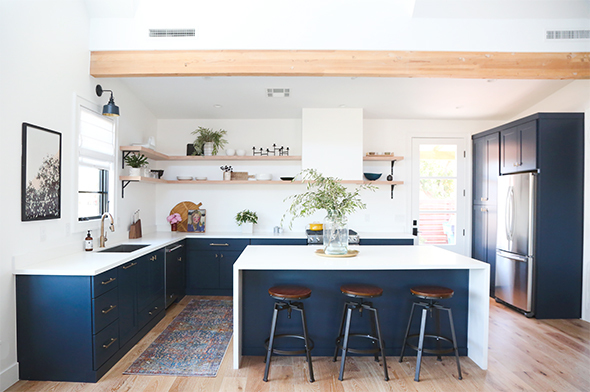 Mine needs a major refresh — I always find such inspiration here! If only we all had unlimited funds, right?! Hi Jenny – would you mind sharing the antique store in Philly you found the dressers. They’re amazing! Oh gosh, it was YEARS ago and I can’t remember the name. I’m so sorry! There are so many great places in Philly though! You can’t really go wrong. 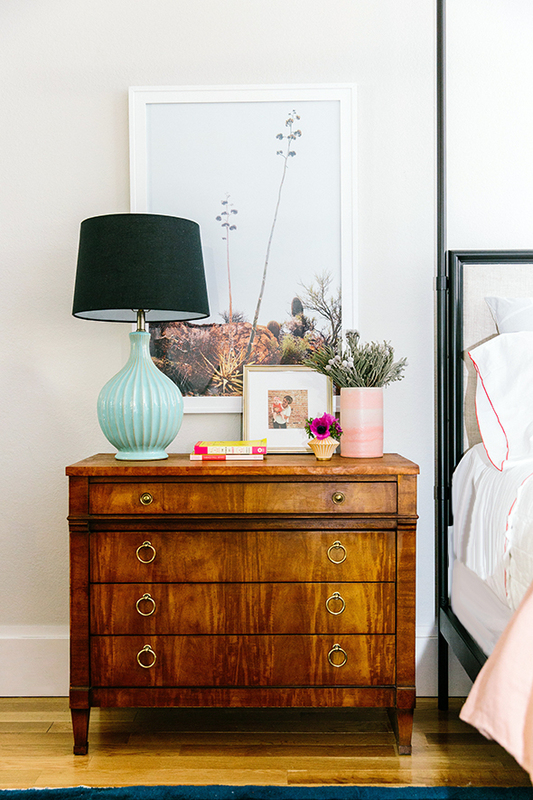 Do you know how tall and wide your nightstands are? 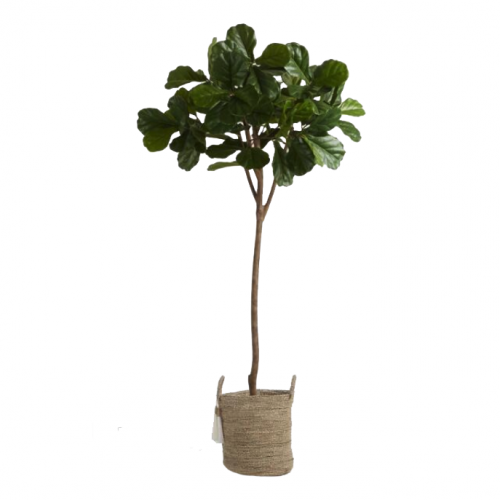 About 30″ tall and 40″ wide. Hope that helps! I’m obsessed with your night stands. Do you know what kind of wood they are? I’m trying to find something similar. Where did you buy your box spring from? Your article made me very impressed.